Perfetto per le vacanze in famiglia o per una fuga romantica per due, questa baita isolata in legno di cedro si trova in una pittoresca valle tra tre acri boscosi sulle rive del fiume Nottely, appena fuori Murphy, nella Carolina del Nord. Le Great Smoky Mountains circondano l'area e offrono viste spettacolari, oltre ad un'abbondanza di attività all'aria aperta. Goditi splendidi tramonti sulle montagne dalle sedie a dondolo sul portico avvolgente o leggendo il magnifico camino del fiume. Mentre la sera si avvicina, vai alla deriva al suono della frusta in lontananza e al bagliore delle lucciole che illumina il cielo. Al mattino, risveglia la melodia delle oche che volteggiano nei laghi vicini. Recentemente rinnovata, la cabina offre spaziose camere familiari e sale da pranzo, un soppalco, quattro camere da letto e due bagni, ed è confortevolmente arredata. Il ponte avvolgente offre una splendida vista sul cortile e sul fiume. Livello inferiore ha un bagno completo con lavatrice e asciugatrice. Il livello superiore ha un bagno completo. The owner was great , helpful when needed ! The beds are amazingly comfortable ,The cabin was cozy , Only reason i didnt give it 5 stars was just a few minor details ! No firewood for the firepit left , needed to be restocked ! No pantry so it was a game of hide n seek to find some essentials ! Other then that i would recommend this place to anyone ! We loved our vacation and our stay at this cabin. I was coming in with 2 kids and 2 dogs for a few days. Trent was very helpful with suggestions for things to do and places to eat. Even let us use an extra dog crate they had so I didn’t have to try and get ours in the car. Cabin is fully stocked, we only had to buy food. Murphy is a great little town and we’ll definitely plan on coming back and staying at this cabin. Highly recommended!! This was a great place to stay for the entire family (plus some). Trent, the owner, is awesome. 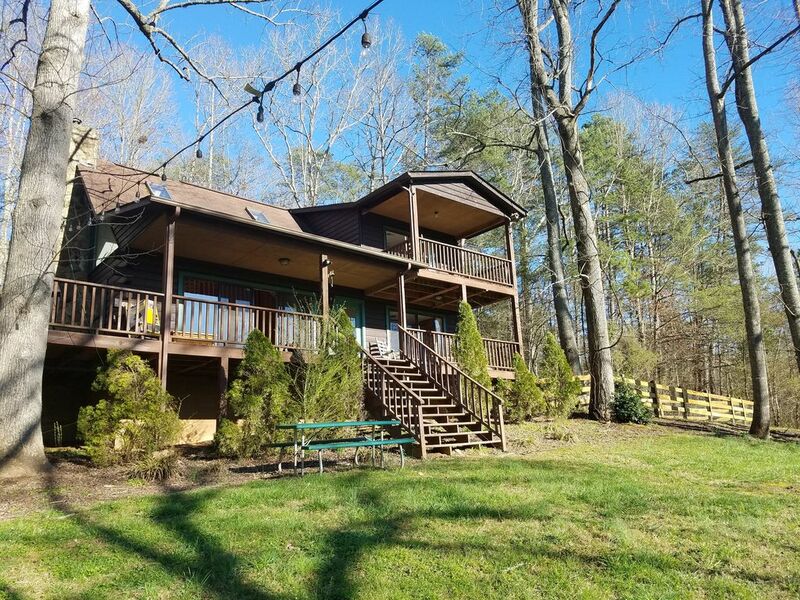 Super nice place to stay, 4 acres to run around in, lake to fish in, deer roaming the area, reading books by the river. It doesn't get better than this! Our family had a great time, spent alot of time outside tho it didnt get above 55-60 degrees it was still comfortable enough to enjoy the outdoors. Had a big fire out in the fire pit 2 nights in a row with Smores and great views of the starry night sky. Even heard a Moose out in the distance 1 night! All in all was a good trip and would definitely come back! Beautiful property. Plenty of room for 3 families. Attentive host. Lots of thoughtful items in the house make it very cozy-warm blankets next to the fire, board games, puzzles. Fully stocked kitchen - we cooked Thanksgiving dinner with no problems. Clean. Couldn’t have asked for a better place. We will be back.